Reality Star Photos: JWoww And Roger, Dorinda Medley, NeNe Leakes And More! Happy pre-Friday! Today Jersey Shore cast members Roger Matthews and JWoww are giving us the warm fuzzies and maybe a glimmer of hope that love will win? 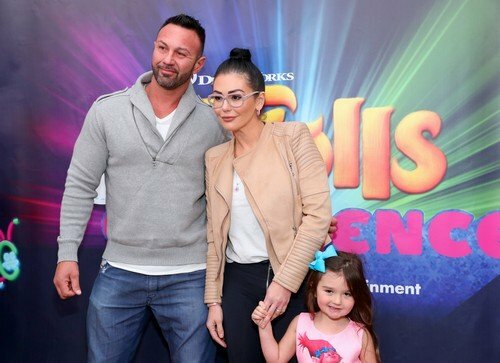 Even though they announced their split and JWoww has filed for divorce, Roger has proclaimed that he won’t stop fighting to reconcile and we are cheering him on. They stepped out together with their daughter Meilani to attend the grand opening of DreamWorks Trolls The Experience in NYC. Real Housewives of New Jersey star Dolores Catania also attended the Trolls event, along with newbie Jennifer Aydin. NeNe Leakes enjoyed a night out in Hollywood to celebrate the Fashion Nova x Cardi B Collaboration Launch event. Khloe Kardashian and Somaya Reece were also spotted at the party. New photo roundup time! Melissa Gorga threw a “Real Housewives Of New Jersey” Season 7 Premiere Shopping Event at the “envy by Melissa Gorga” boutique in Montclair and was joined by her daughter Antonia. Coco Austin, La La Anthony, Somaya Reece and more turned out for the VH1 Hip Hop Honors. Kathy Wakile and Carole Radziwill both stopped by Sirius XM for interviews this week. Real Housewives of New York’s Sonja Morgan hit the red carpet at the premiere of “Difficult People” with her daughter Quincy. Below you’ll also find pics from Real Housewives of Melbourne’s Jackie Gillies and more!